SDG Style! 14" ALUMINUM FRONT RIM WHEEL CONDITION: Brand New For DISC brake assembly ONLY! 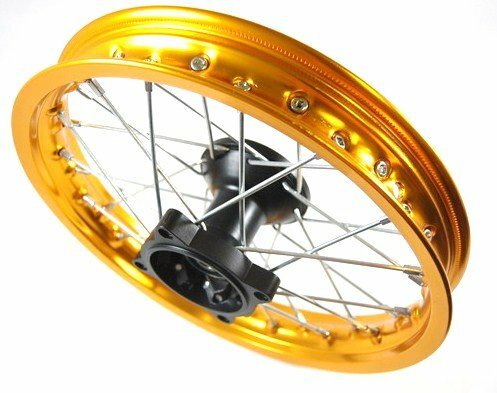 COLOR: GOLD SIZE: 14" / The inner diameter of the wheel bearing are 12mm or 15mm DEFAULT BEARINGS ARE 15MM. If you wish to have 12mm bearings instead, please contact us right after ordering so we can provide further assistance to you. bolt to bolt-rotor side: 72mm Heavy duty spokes and anodized alloy rim. It makes the bike more stable at high speed, stops wobbling, the bike will ROLL over obstacles easier, and it will also have more ground clearance. This is probably the best performance upgrade for the money. This rim should fit most Chinese made pit bikes with DISC brake assembly. If you have any questions about this product by PCC, contact us by completing and submitting the form below. If you are looking for a specif part number, please include it with your message.